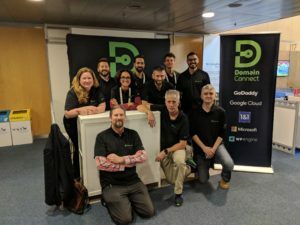 Domain Connect has been around for a couple of years, but we had a coming out part at ICANN in Barcelona during the week of October 21st 2018. Several DNS Providers (1&1 and GoDaddy) along with Service Providers (Google, Microsoft, and WPEngine) were present. We were also had help from Hubspot and from the Domain Name Association (DNA). Our goal was to make sure people knew what Domain Connect was and how it helps the industry. To that end the event was highly successful. The most common reaction was “this makes a ton of sense”. We shared several case studies (links will be shared from here in the next couple of weeks) outlining the benefits to Service Providers, DNS Providers, and of course Consumers.